Minister of Basic Education administering a Mebendazole tablet to a school child. The National Deworming Campaign in Cameroon was launched on Wednesday, 9th March 2016 at Government Primary School Mfandena II, Yaounde by the Minister of Public Health and the Minister of Basic Education. The inauguration was attended by both national and international partners such as the World Health Organisation, Helen Keller International, Sight savers,Perspective and International Eye Foundation. On this consequential event which falls in line with the activities implemented by the National Programme for the Control of Schistosomiasis and Intestinal Helminthiasis in Cameroon, the government and partners reaffirmed their allegiance in impeding the burden caused by these worms. 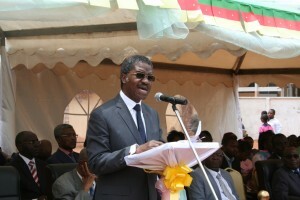 In his speech, the Minister of Public Health accentuated that parasitic worms affect about 10 million Cameroonians around the country, with school-aged children being the most affected. Not only do these infections cause retarded growth and other health difficulties, but they are easily transmissible. Evaluation studies of the annual deworming of school-aged children, carried out by a team of researchers encourages us to continue with our collective efforts as they indicate a decline in the prevalence of these diseases in all ten regions of the country. In the Centre region for example, the prevalence of schistosomiasis have globally shifted from 91% in 1997 to 28% in 2010. In the case of Yaounde town, the level of infection has declined exceedingly in all districts. Between 2010 and 2016, the prevalence of schistosomiasis went from 41% to 0% at Government Primary School, Nkolbisson, and from 25% to 2% at Government Primary School, Obobogo and the same results have equally been observed at Government Primary School, Mbala II where the prevalence went from 20% in 2010, to 0% in 2016. With respect to the prevalence of soil-transmitted helminthiasis (STH), results demonstrate that for the same period (2010 to 2016), the prevalence of STH dropped from 11% to 4% at Government Primary School, Nkolbisson, 13% to 2% at Government Primary School Obobogo and 16% to 6% at Government Primary School, Mballa II. Albeit a drop in the prevalence, more work still needs to be done, as results from these government-sponsored assessments signal a slow deterioration in the rate of infection in some educational institutions such as Government Primary School, Mfandena II where there is a 6% decrease(16% to 10%), from 2010 to 2016. The Minister of Public Health was pleased and commended the Ministry of Basic Education for its implementation of school health programs because as he stated 'the persistence of bad conditions in schools is a major cause of the persistence of these problems'. He requested that more care and attention be taken when consuming fruits and vegetables and urged parents and children to properly wash all vegetables and fruits such as mangoes before consumption. The Minister appraised and thanked the collective efforts offered by all teachers, districts chiefs, heads of health centres and all partners especially the pharmaceutical companies Johnson & Johnson and Merck, for their generous donation of Mebendazole and Praziquantel respectively. This close collaboration allows for the free deworming of 5 million school children and 3 million pre-school aged children during the Mother and Child Health and Nutrition Action Week. 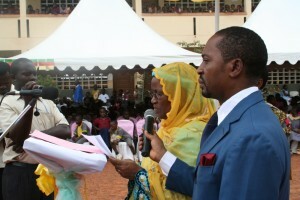 In the same line, the Minister of Basic Education, Youssou f Hadjidja Alim emphasised the importance of tackling these intestinal worms due to the consequences they inflict on our children such as retarded growth, learning disabilities which in turn account for poor academic development due to absenteeism. 'If all these consequences are not corrected in time, they risk affecting the attainment of sustainable development objectives in Cameroon so it is for this reason that promoting quality education is vital'. In a bid to buckle down these consequences, the Government has made health in schools a constant priority with the provision of latrines and appropriate water systems, in an attempt to improve the health status of teachers and school children in all regions of the country. 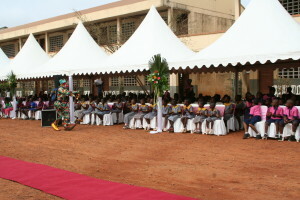 School children from various primary schools in the Mfoundi area. Reports of the 2015 National Deworming Campaign indicated an 87% therapeutic coverage of all regions with mebendazole, while the use of praziquantel in endemic area yielded a 45% coverage. These results as mentioned by her excellency, 'are encouraging and motivate us to continue to work alongside the Ministry of Public Health, in combatting these diseases which affect school-aged children'. Reinfection is also of great concern, so the public is urged to remain vigilant and make use of all appropriate hygienic practices. 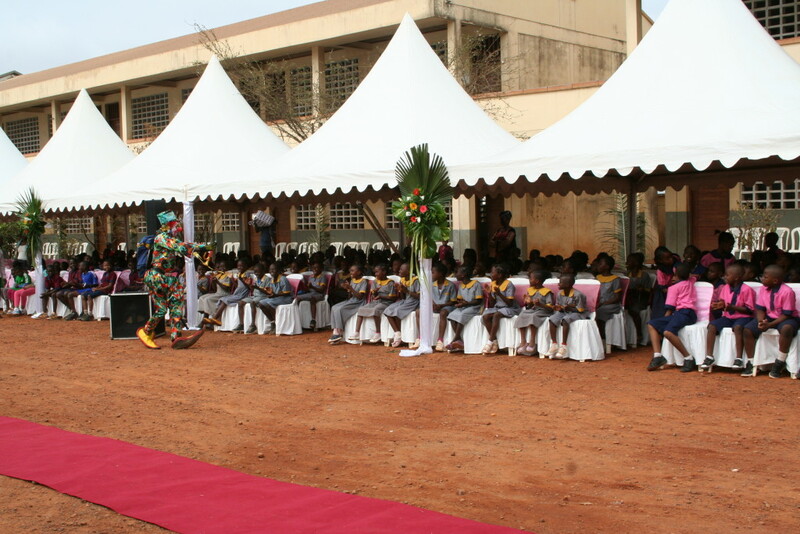 Her excellency thanked all teachers for their continuous efforts in instilling in the children, these good practices such as defecating only in the latrines and washing of hands after using the toilet. The Permanent Secretary for the National Programme for the Control of Schistosomiasis and STH, Professor Louis-Albert Tchuem-Tchuente also informed that the children being dewormed will also consist of pre-aged school children who will be targeted during the vaccination campaigns. Deworming children does not only improve their general health, but it also enables them to study better in school, at all levels. Communities, international organisations and other stakeholders were urged to join the movement and implement wider disease prevention and control. 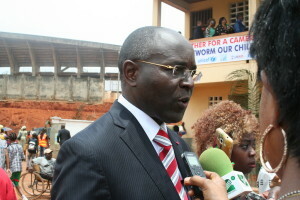 In his speech, the Minister of Public Health accentuated that intestinal worms affect about 10 million Cameroonians around the country, with school-aged children being the most affected. Not only do these infections cause retarded growth and other health difficulties, but they are easily transmissible. Evaluation studies of the annual deworming of school-aged children, carried out by a team of researchers encourages us to continue with our collective efforts as they indicate a decline in the prevalence of these diseases in all ten regions of the country. In the Centre region for example, the prevalence of intestinal worms have globally shifted from 91% in 1997 to 28% in 2010. In the case of Yaounde town, the level of infection has declined exceedingly in all districts. Between 2010 and 2016, the prevalence of schistosomiasis went from 41% to 0% at Government Primary School, Nkolbisson, and from 25% to 2% at Government Primary School, Obobogo and the same results have equally been observed at Government Primary School, Mbala II where the prevalence went from 20% in 2010, to 0% in 2016.